These are the first pictures of the all-new Mercedes-Benz sports car that comes with a hint of the company's past. Called the SLS AMG, it will be fitted with vertically opening doors, a feature that defined the classic gullwing model of the 1950s. And it's not merely style over substance, as Mercedes-Benz says the doors require less room to open than conventional coupe doors. Crucially they can be opened in standard sized garages too. On the engine front, the newcomer will be fitted with a 6.3-litre V8 producing 571bhp along with immense low down pulling power. This means the SLS can accelerate from 0-62mph in a mere 3.8 seconds - as fast as a Porsche 911 Turbo - and will reach an electronically limited top speed of 197mph. It's fitted with a seven-speed twin-clutch automatic gearbox which can change gear in milliseconds for super smooth yet rapid shifts. There's also a Race Start function which gives maximum acceleration from a standstill. 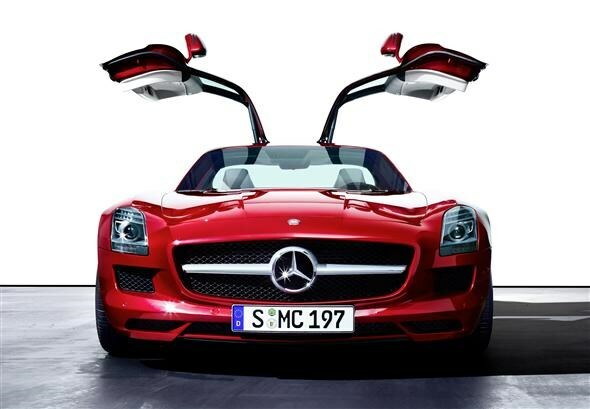 When it comes to looks the SLS AMG gets LED lights and indicators plus an automatic spoiler that pops up at speeds over 75mph. Elsewhere, the side vents, extra wide grille and gullwing doors are reminiscent of the original gullwing from 1955. 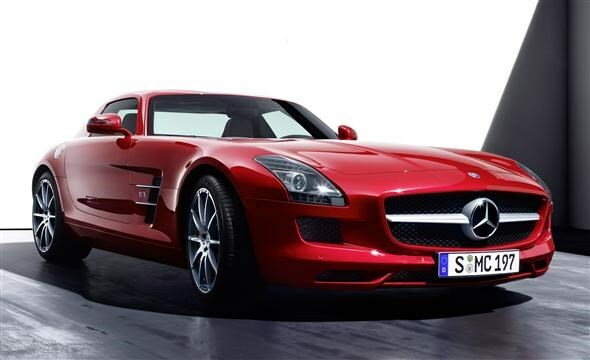 The exclusive SLS AMG will be on sale in summer 2010 with prices expected to start at around £175,000. That's certainly not cheap, but there's likely to be no shortage of demand for the stylish Mercedes-Benz two-seater.